Thursday 15th was a good night for the South Devon Railway. 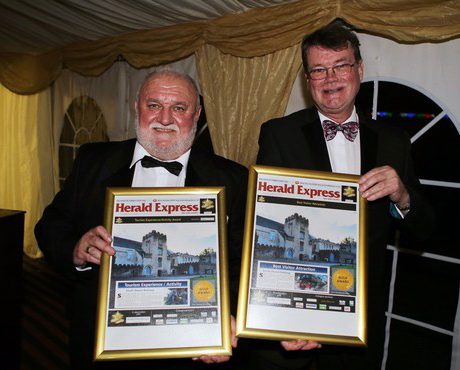 We went along to Torre Abbey for the English Riviera and South Devon Tourism and Hospitality awards dinner last evening and we won (joint) TWO Gold awards as ‘Best Visitor Attraction’ and ‘Best Tourism Experience/Activity’ for our ‘Drive a Train’ product. This brings our awards count for the year so far to five, viz: Trip Advisor Certificate of Excellence 2015; Transport Trust’s Young Preservationist of the Year for Alasdair Page; RHS and Britain in Bloom ‘Outstanding’ award, and the latest two Golds. We now have to wait until 26th November to find out what, if anything, we have won in the ‘Devon Tourism’ awards to be announced in Plymouth that night. The SDR has entered two categories this year, but we are aware the number of entries has increased on 2014 and so the competition is high.